With the Holidays just around the corner, we are releasing these 3 icons for you to use. 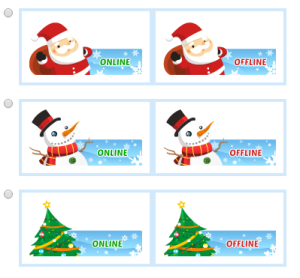 To enable one these icons please go to the Account Dashboard > Setup > Design Customization > Online/Offline Icons and then scroll to the bottom and select which icon you like the best. This entry was posted on Friday, November 20th, 2015 at 12:30 pm	and is filed under Uncategorized. You can follow any responses to this entry through the RSS 2.0 feed. Both comments and pings are currently closed.